Update: We have passed 25,000 signatures — help us deliver 30,000 on Thursday morning! Trump is making a beeline back to “fire and fury” with North Korea — and John “Bomb ‘em” Bolton is egging him on. But South Korean president Moon Jae-in is meeting with Trump this week, and he’s bringing with him the Korean people’s mandate for peace. If we can deliver 25,000 signatures to the South Korean embassy before Moon arrives, we would send an unmistakable signal that the American people stand with his pursuit of diplomacy, not with Trump’s childish war tantrums. 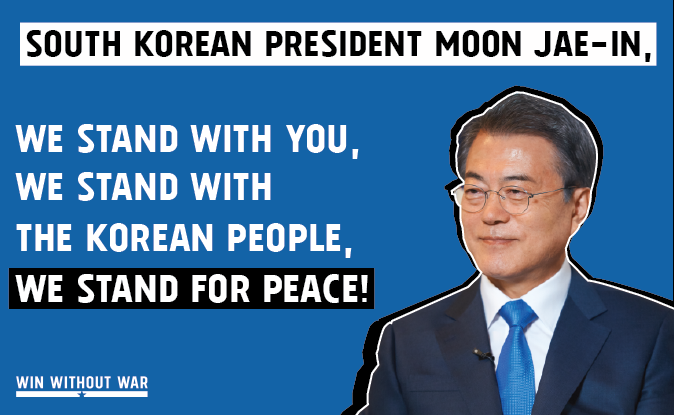 Add your name to tell President Moon: We stand with you, we stand with the Korean people, and we stand for peace! The American people stand with the Korean people and with you in your pursuit of peace through diplomacy, rooted in the belief that the Korean people have the right to determine their own destiny. We also strongly oppose any return to the threat-making and coercion that has been the hallmark of this issue for too long.